Taoiseach to Drumm: "Cooperate fully and completely"
The ex-Anglo boss wants to speak to the Banking Inquiry remotely. But the plan’s not going down too well. TAOISEACH ENDA KENNY has said David Drumm should cooperate fully with the Banking Inquiry, after the former Anglo CEO suggested he give his testimony by video link. The Oireachtas committee set-up to examine the banking crash is legal advice on Drumm’s suggestion – but a number of members have said he should appear in person next Wednesday. Anybody that they’ve been in contact with those people should cooperate fully and completely with the Banking Inquiry and in my personal view that includes Mr Drumm. The ex-Anglo boss has already provided the committee with a written statement. On Morning Ireland earlier, Sinn Féin committee member Pearse Doherty said he didn’t have a concrete view one way or the other whether the video evidence should be allowed. He would wait to hear the advice on the issue, and the committee as a whole would make a decision when it meets in private session next Tuesday, he said. Advice would be sought in issues like the admissibility of video evidence, and whether an oath or affirmation could be taken remotely. A number of Fianna Fáil TDs, including Banking Inquiry member Michael McGrath, have been heavily critical of the suggestion. 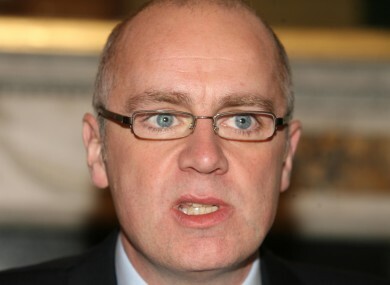 “It has been widely reported that the Irish justice authorities have taken steps to secure the extradition of David Drumm from the United States to Ireland in connection with ongoing criminal investigations,” the party’s finance spokesman said. “Mr Drumm has refused thus far to make himself available to the Irish authorities including to An Garda Síochána for questioning. Facilitating Mr Drumm’s ongoing refusal to cooperate with criminal investigations in Ireland by agreeing to a video link from the US goes against everything I stand for in public life and would, I believe, be a grave error by the Banking Inquiry. McGrath said he was strongly against the idea, and had sought his own legal advice on it. “I am advised that, by refusing to appear before the Committee in Leinster House next Wednesday as directed under the Act, Mr Drumm is in breach of the Direction Order issued to him under the Houses of the Oireachtas (Inquiries, Privileges and Procedures) Act 2013,” he added. He has also written to Banking Inquiry Chairman Ciarán Lynch, he said, requesting that the views of the DPP on the possible impact on “forthcoming and possible future criminal trials of Mr Drumm giving verbal evidence to the Banking Inquiry in this way”. If this engagement with Mr Drumm were to proceed, I am deeply concerned that comments made remotely from the United States could prejudice forthcoming criminal trials in Ireland. I will not support or play any part in such an exercise. Previously, former president of the ECB Jean-Claude Trichet answered questions from members of the banking inquiry at another location with his answers in that case considered admissible as evidence. Also speaking this morning, Renua leader Lucinda Creighton said Drumm should appear in person. “I think there has to be some degree of respect for our national parliament,” she said. This is a banking inquiry that is mandated by our national parliament and I think Drumm should appear before it in person. A file on David Drumm was given to the Director of Public Prosecutions by the Garda Bureau of Fraud Investigation and the Office of the Director of Corporate Enforcement in 2011. With reporting by Rónán Duffy and Cliodhna Russell. Email “Taoiseach to Drumm: "Cooperate fully and completely"”. Feedback on “Taoiseach to Drumm: "Cooperate fully and completely"”.